Spindleruv Mlyn in the Krkonose (giant) mountains is the most famous mountain resort in the Czech Republic. Spindl (as locals call it) is a great winter sports resort as well as a popular summer destination. It is attractive for families with Family Friendly hotels and beautiful nature and definitely worth the trip if you live here or visit as a tourist. 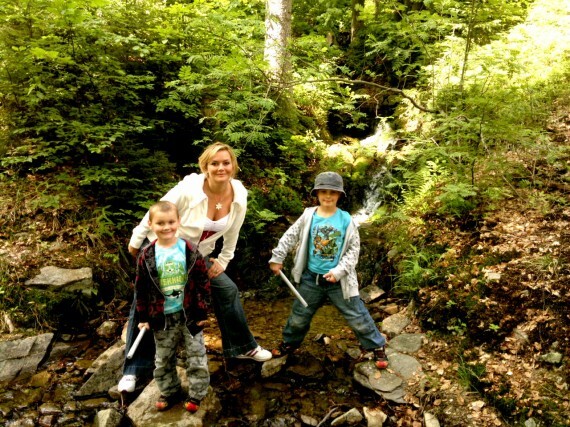 Get rejuvenated in a little unspoilt corner of the forests or the nature park - KRNAP (Giant Mountains National Park) Go down the Bobsleigh, mushroom picking or visit the Sweet Shop and Cafe by the White Labe river. The kids will love it. It’s funny how little information I found on Internet. Even Wikipedia claims they have very little information and forget about complex information for families. So here we go :-) I will try my best. We have been going to SPINDL every 2 years. In summer or in winter. Sure, it has been always considered a town of celebrities but I never experienced any turmoil there. 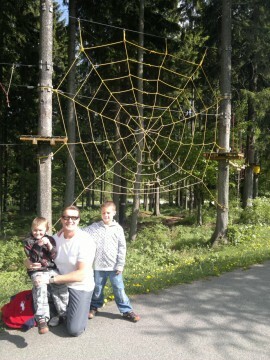 My boys are 5 and 6 now and they still need children’s facilities or at least a swimming pool in the hotel. I always knew there was a hotel with an Indoor playground in Spidleruv Mlyn and it is Family Friendly but we have never stayed there. It’s called the Hotel Lenka and is right at the bottom of Svaty Petr (the biggest and most famous slope in Spindl). 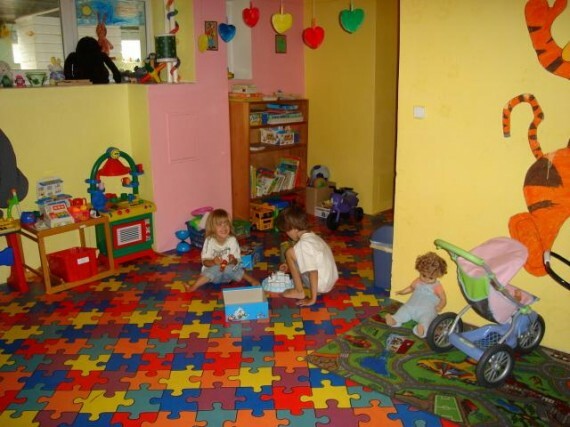 There is an agency that provides babysitting in the fore-mentioned Indoor Playground of the hotel Lenka or they can send an experienced Au-Pair wherever. The Hotel Lenka has a whirlpool, fitness and 5 tennis courts. Its a 3* hotel so I dont know how efficient they are in their services. Its just a tip. The last time we went we have stayed in the hotel ADAM****. We were very happy. We booked the Family room that has 2 rooms so the boys were separated from us and it was on the same floor as the restaurant and bar. We could leave them in the room playing on the iPad and have a drink. They could easily find us. Right next to our room there was an outdoor playground and above the hotel there was a trampoline and play area where they could run around. We totally love the view. When we opened our eyes in the morning we saw a big green hill with the slope in the middle. It was so refreshing. Hotel ADAM was fully refurbished and was clean and efficient. They have very nice sauna and swimming pool on the premises. The water in the pool was warm and my boys had a blast. The terrace was facing the same green hill and I felt I was getting my strength back when relaxing on the terrace bed. Everybody who goes to Spindl must have a walk along the “Bile Labe” (White Labe) Trail. One of the biggest Czech rivers, the Labe starts streaming in the mountains above Spindleruv Mlyn. 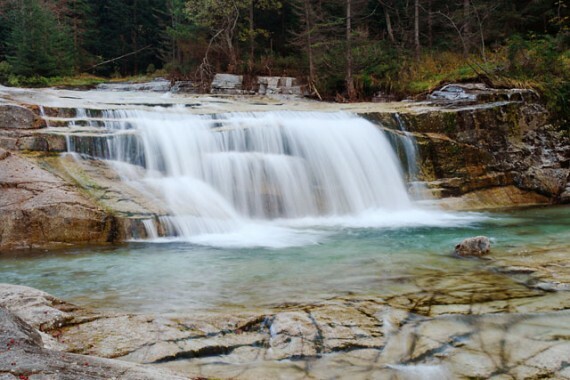 As it comes down through the forests the crystal clear waters splashing over huge boulders is an amazing sight. Funnily enough the Trail alongside the White Labe is called Weeberova cesta (Weberova Trail). The White Labe (German Weisswasser) is a left-hand tributary of the River Elbe in the Giant Mountains. It is the first major tributary of the Elbe. The flow length is approximately 8.3 km. It’s surrounded by beautiful nature and of course our boys ended up, in the stream without shoes. It’s very inviting but be careful, it’s quite slippery. The river has several cascades all the way to the centre of Spinlderuv Mlyn. Everybody takes nice pictures by the white arch bridge in the centre of Spindleruv Mlyn. The scenery of the river is amazing there. Another of the most important tourist destinations is Sněžka, the highest mountain of the Czech Republic. Sněžka (Sniezka Polish, German Schneekoppe) at 1602m is the highest mountain border (Silesia) in the Sudetenland, Bohemia and the Czech Republic and the whole of Silesia. Many people take a hike up or take a cable up the hill. Unfortunately the cable is shut down for reconstruction and most probably will be shut for another 2 years. It’s is 2012 now. 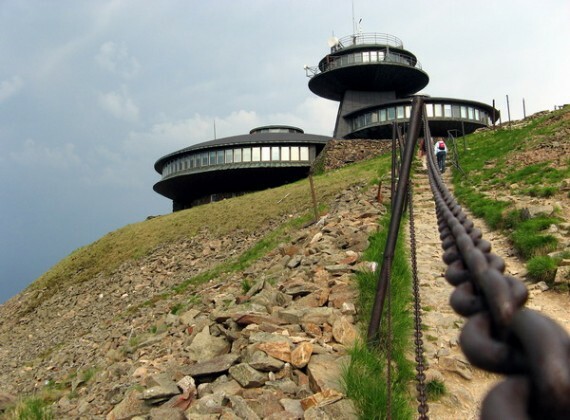 This is an important landmark on the eastern part of the Giant Mountains (KRKONOSE). Sněžka passes over the top Czech-Polish border. Everybody who comes to KRKONOSE (Giant Mountains) must know the fairy tale figure called KRAKONOS - the symbol of the Giant Mountains. There was a living one in Spindl who was promoting a restaurant of the same name. Imagine what an attraction he was. 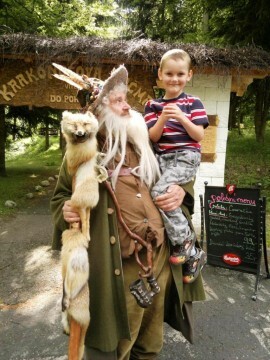 There is a very popular Czech Children Story featuring Krakonos which was about him protecting the mountains, helping the poor, appearing and disappearing on his wooden skis on the hills of Krkonose. Krakonos is a mythical mountain spirit, which in various forms protects mountains and its hills and meadows from greedy treasure hunters, poachers and other thieves. His figure has been used in many stories by local and foreign writers. You will find souvenirs with his image all over Spindleruv Mlyn. Many meals on menus will carry his name as well as Pubs. 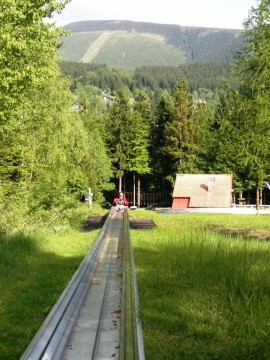 If you are there definitely go to the Bobsled. Its long course with a beautiful view in great nature. Before you know 800czk will be gone with 6 rides! The length is 1,400m including transport and equipment. The rider enjoys 22 turns, 5 jumps (off-road twists) and three tunnels. Good-quality refreshments are available to the visitors at the bottom, including grilled sausage and ice cream on the terrace where you can sit close to the bobsled track and observe your family. 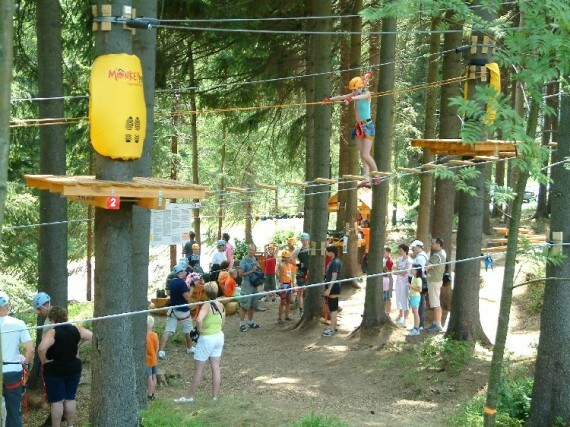 I guess you’ve got some idea of what you can do in Spindleruv Mlyn. I could be writing on and on but I’ve summarised our trip there pretty thoroughly. It’s definitely a place to go as well as Karlovy Vary, Cesky Krumlov, Hluboka nad Vlatvou or other famous Czech holiday experiences. Dont forget this is one of the TOP winter places too. You will find it all here. 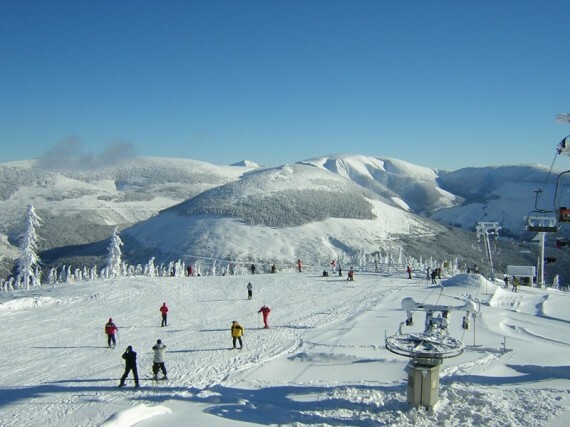 Spindl is one of the most popular winter sports resorts in the Czech Republic. It’s total capacity is around 10 000 beds. 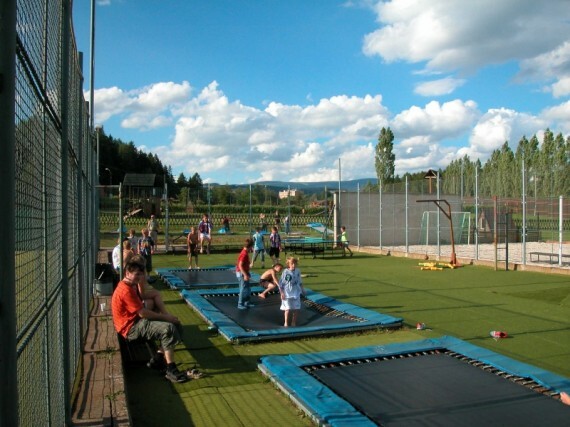 Spindleruv Mill has ideal conditions for all kinds of winter sports. Ski trails are open for 5 months of the year. Professionally groomed slopes have different kinds of difficulty. With one ski pass you can ski for more than 25 kilometres on groomed slopes at 4 different ski resorts (St. Peter, Medvedin Upper Mountains, Elbe).